Beautiful new kitchens with granite countertops, undermount sinks and stainless steel appliances. 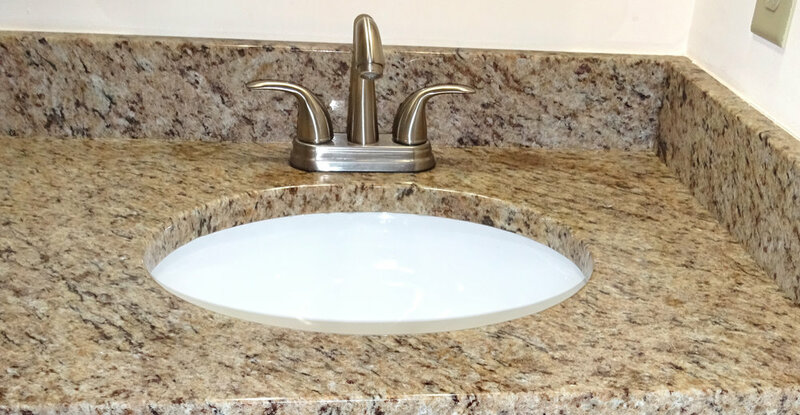 New bathroom vanities with granite countertops and undermount sinks. Spicetree features spacious two bedroom and two full bathroom unfurnished/furnished apartments in a gated community! How close do you want your apartment to be to Marshall's University's campus? Greentree, Spicetree, Longbranch,and Lexington Apartments all are within a few hundred feet of Marshall University. DIRECTIONS TO SPICETREE APARTMENTS: Take Hal Greer Blvd., Exit 11, off I-64. Turn north towards Huntington. Travel to corner of Sixth Avenue & Hal Greer Blvd. Turn right. Office for the Spicetree Apartments is at the Greentree Building, located at 1615 6th Avenue.